In 2011, one fatality involved dogs from up to four different dog breeds, thus producing a death count total of 34 rather than 31. Up to seven dog breeds contributed to one death: Alaskan malamute, American bulldog, bulldog (American or English not specified), cane corso, doberman pinscher, German shepherd and Japanese akita. Together, pit bulls (23) and rottweilers (4), the second most lethal dog breed, accounted for 87% of the total recorded deaths in 2011. This same combination accounted for 75% (160) of all fatalities during the 7-year period of 2005 to 2011. The breakdown between these two breeds is substantial over this 7-year period. From 2005 to 2011, pit bulls killed 130 Americans, about one citizen every 20 days, versus rottweilers, which killed 30, about one citizen every 85 days. Annual data from 2011 shows that 58% (18) of the fatality victims were adults, 21- years and older and 42% (13) were children, 11-years and younger. Of the total children killed by dogs in 2011, 62% (8) were ages 1-year and younger. Notably, data from 2011 shows that adult victims of fatal pit bull attacks more than doubled the number of child victims. Of the 23 total pit bull victims, 70% (16) fell between the ages of 32 and 84, and 30% (7) were ages 5-years and younger. The year of 2011 also marks a notable increase in family pit bulls killing their owners. Of the 8 total instances this year in which a family dog inflicted fatal injury to its primary caretaker, the dog's owner, 88% (7) involved family pit bulls. 35% (11) of all dog bite fatalities in 2011 involved more than one dog; 29% (9) involved breeding on the dog owner's property either actively or in the recent past, and 7% (2) involved tethered dogs, down from 9% in 2010 and 19% in 2009. In 2011, dog ownership information shows that family dogs comprised 65% (20) of the attacks resulting in human death; 77% (24) of all fatal dog attacks occurred on the dog owner's property and 23% (7) occurred off the owner's property. 29% (9) of all deaths resulted in criminal charges in 2011, up substantially from 12% in 2010 and 13% in 2009. In 2011, 89% (8) of these criminal cases involved pit bulls. North Carolina filed criminal charges in 2 dog bite-related fatalities in 2011. 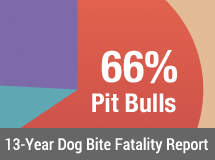 The states of California and Texas led deadly dog attacks in 2011, each with 4 deaths; pit bulls and their mixes contributed to 88% (7) of these deaths. North Carolina, South Carolina and Virginia each incurred 2 dog bite fatalities. Change Log: In February 2017, the 2011 Dog Bite Fatality Statistics were reissued with the following changes: The death of Mable McCallister was reclassified as a 2011 dog bite fatality. Mable died on December 31, 2011 after being attacked by her grandson's pit bull. The 7-year combined total deaths of pit bull and rottweilers (from 2005 to 2011) increased by 1% due to reclassifications and additions in earlier years. In August 2015, minor adjustments were made to the overall 2011 statistics. One family dog attack was reclassified to non-family, evidence of breeding activity was added to one case and evidence of chaining was added to another. 2011 data from Animal People (More Adoptions Will Not End Shelter Killing of Pit Bulls, by Merritt Clifton, Animal People, October 2011) scales back the total population of pit bulls from 5% (Decade of Adoption Focus Fails to Reduce Shelter Killing, by Merritt Clifton, Animal People, July/August 2009) to less than 5%, specifically to 3.3% of the total U.S. dog population.